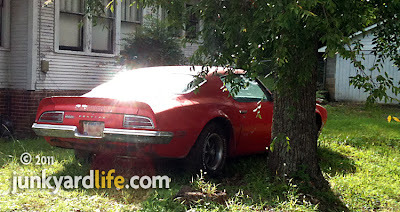 Santa didn't leave a Buccaneer Red 1973 Trans Am under my tree this year. 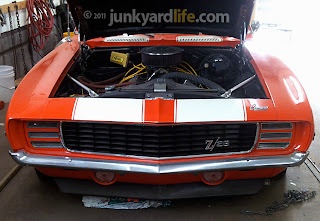 But I did have this 455-powered ’73 T/A project on my wish list this year. This Trans Am, one-of-4,772 built for the 1973 model year, reappeared this summer after being tucked away in an ancient, clapboard garage several years ago northeast of Birmingham, Alabama. 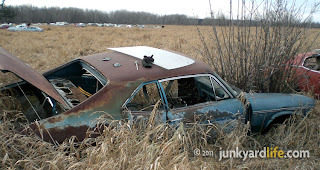 The owner didn’t want to talk about his rare bird when I first saw it parked in his driveway in front of his battered, Carousel Red, 1969 Pontiac GTO. 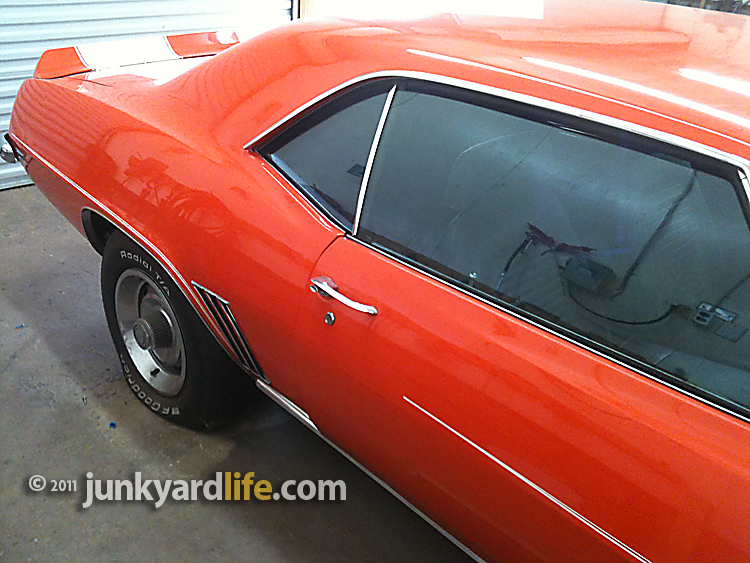 I remember the GTO had Judge decals and a black plastic bag covering the passenger's side window. 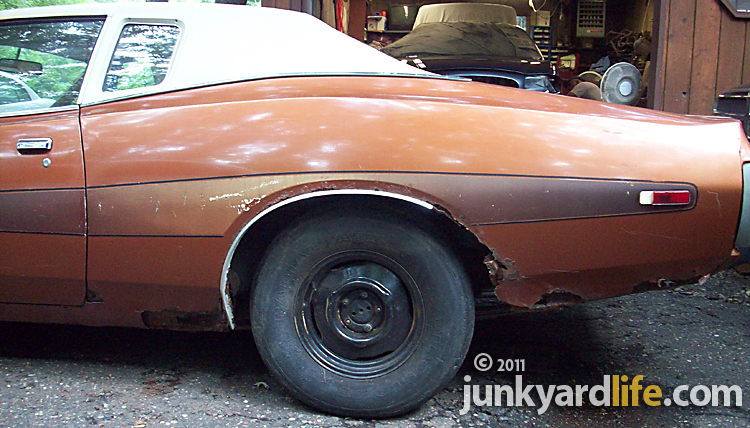 The Trans Am scabbed with severe rust damage in its lower tail panel. Two rare Pontiacs parked in the elements. Oh, the humanity! 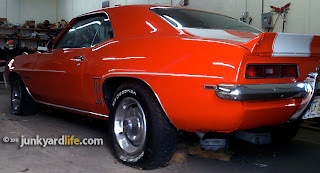 The owner, possibly a Pontiac fan like myself, had no intentions of selling the Trans Am or GTO to me or anyone else that day or that year, for that matter. With minimal pleasantries exchanged, I gathered that full restorations on both Pontiacs were in his plans. Maximizing his profits when they were sold was the name of the game that day. Be on your way now. 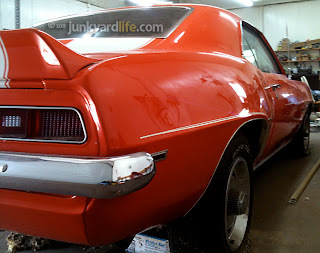 1973 was the last year of the Endura front bumper on the Pontiac Trans Am and the first year of government mandated 5 mph front bumper standards. It must have been late July or early August, two years after I first spotted the T/A in the yard, when I slammed on the brakes. The Buccaneer Red Trans Am briefly reappeared to taunt me on my way to work. Was it a Super Duty? 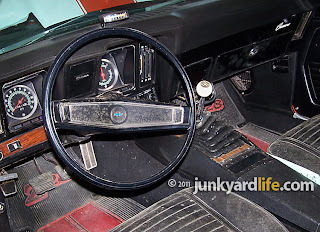 Four-speed? 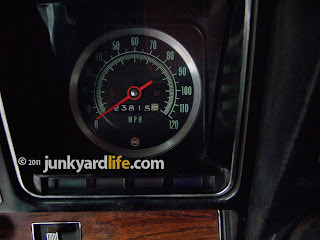 I dreamed of hammering through the gears and listening to the 455-V8 roar. Why was it parked outside? A few days passed and the red, rusty beauty was gone. My questions remain unanswered, for now. The 1973 Trans Am was a year of many firsts. It was the first year Pontiac offered the hand-built, beefed-up, Super Duty 455-V8 engine. 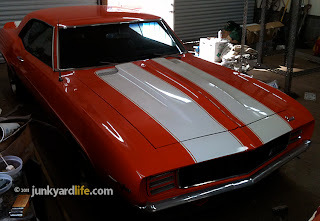 Trans Ams needed little help attracting attention on the road but 1973 was the debut of the large, iconic, decal that featured Firebird’s screaming chicken graphic smack dab in the center of the hood. 1973 was also the first year the second generation (1970-1981) Trans Am was offered in colors other than Cameo White or Lucerne Blue. 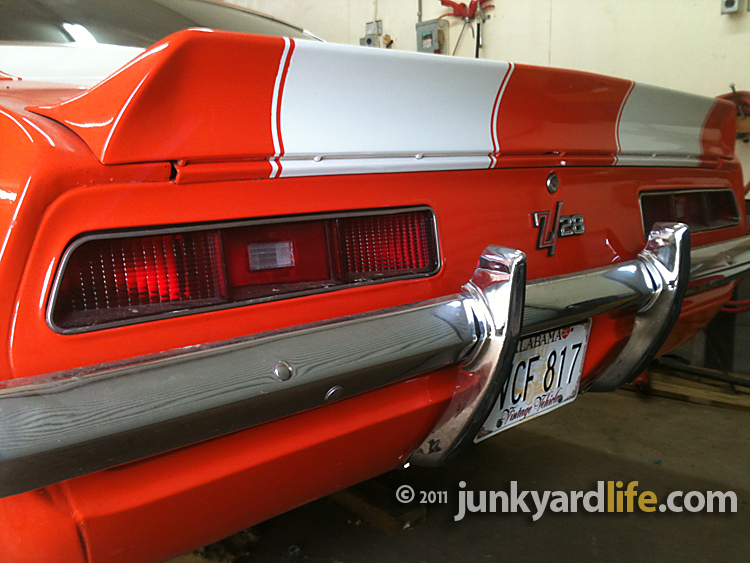 Single, wide stripe T/As were no more. Buccaneer Red, Brewster Green and Cameo White were the only paint options. 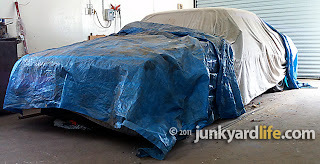 Lucerne Blue was no longer an exterior color option. Buccaneer Red 1973 Trans Ams are rare birds and were the epitome of "The Fast and Furious" in the 1970s. 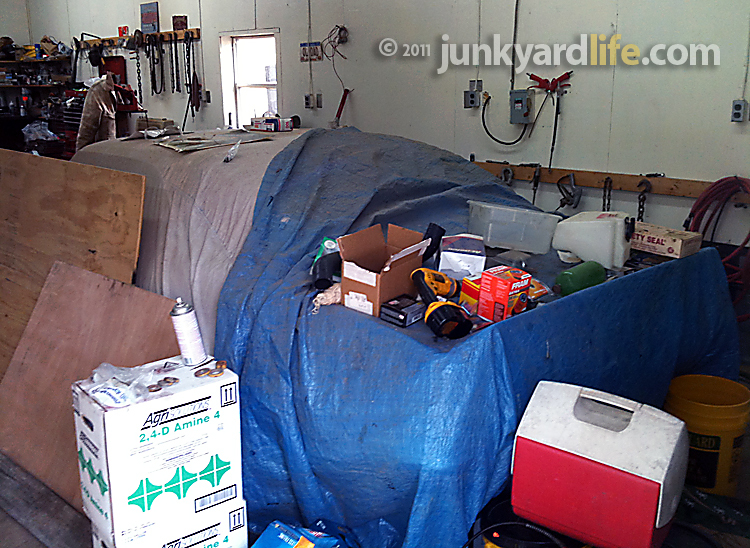 Being a car guy at times can be painful. You see things you don’t want to see. 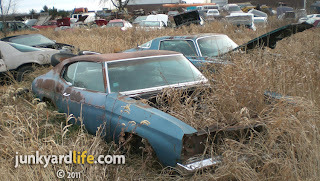 Or you find things you are looking for but under the wrong circumstances. 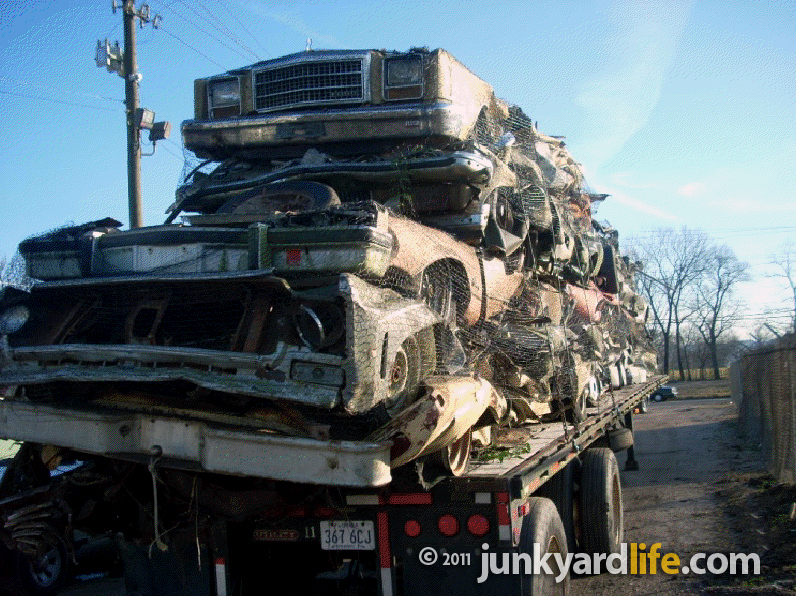 Such as this trailer in Birmingham, Alabama loaded with crushed cars and mangled parts. 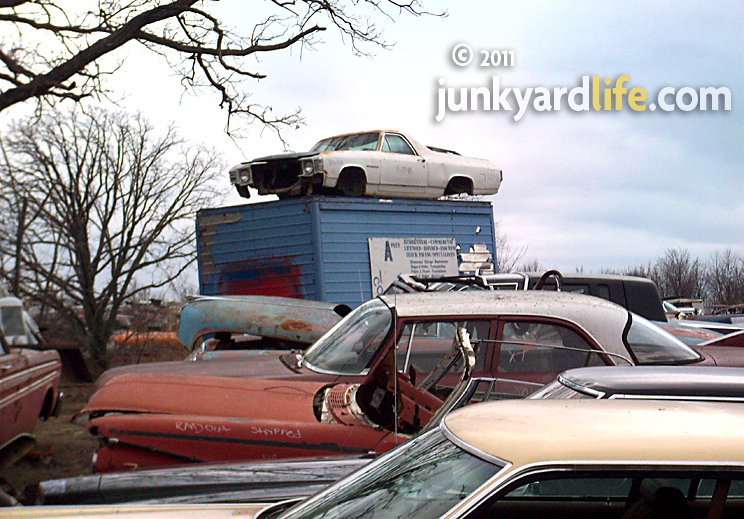 This gruesome sight made me stop in my tracks when I saw a rare Grand Prix flattened under a stack of cars. 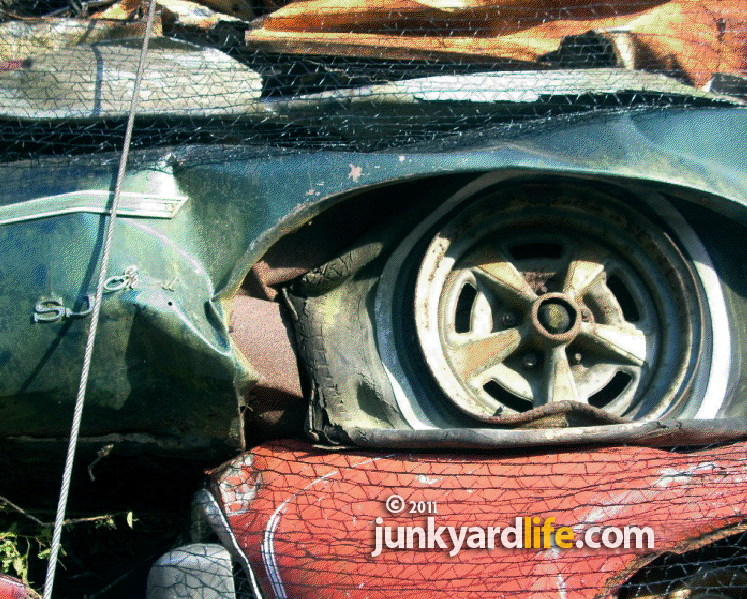 What's worse than a crushed Pontiac Grand Prix SJ? A crushed, green SJ with Rally II wheels! Kill me. 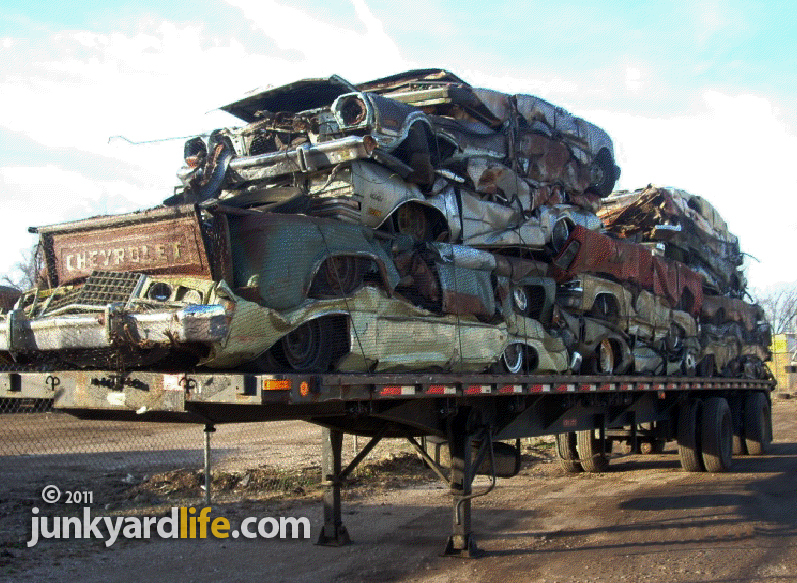 One trailer load of parts that have been scrapped. 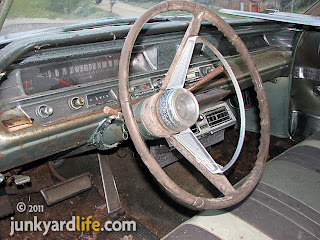 An early sixties Chevrolet pickup that was still wearing its dog dish hub caps. 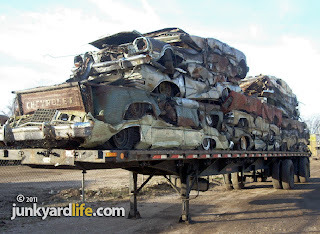 There were actually two of those, one was on another trailer full of newer vehicles that we probably won’t miss, like Ford Festivas and such. 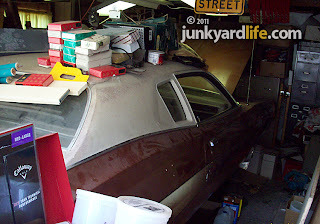 An early seventies Pinto wagon. A mid seventies Buick Century. 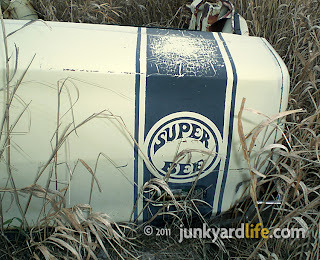 I know, although not super collectible now, I guarantee someone is looking for this. 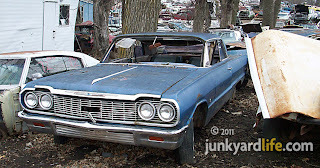 Two 1963 or 1964 Chevrolets. 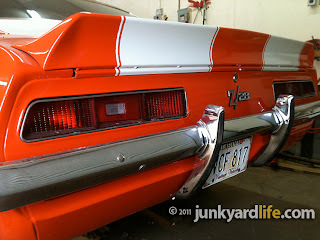 One of them was a Biscayne with original emblems. 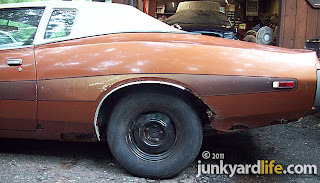 A Pontiac that I could only identify by its 15-inch Pontiac Rally II wheels. 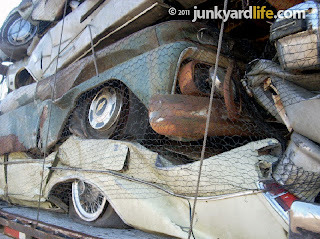 It was mostly intact with trim rings and Pontiac arrowhead centerpieces. Late 1970s Ford Granada - often sought out for their brakes and front end parts for early Mustang and Falcon owners. 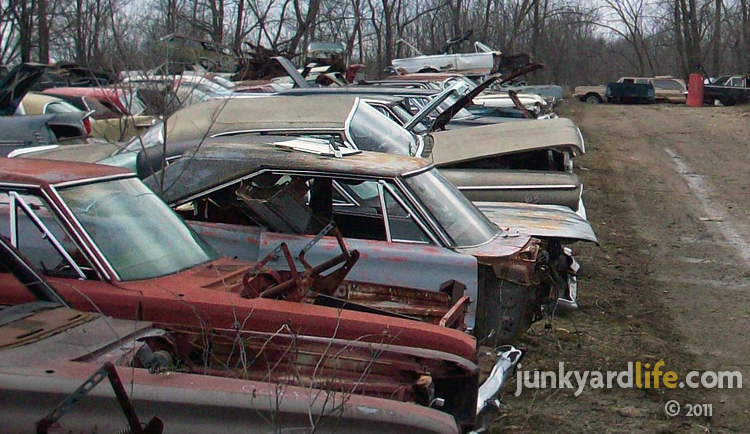 Sure, there's some ugly in that stack of cars. 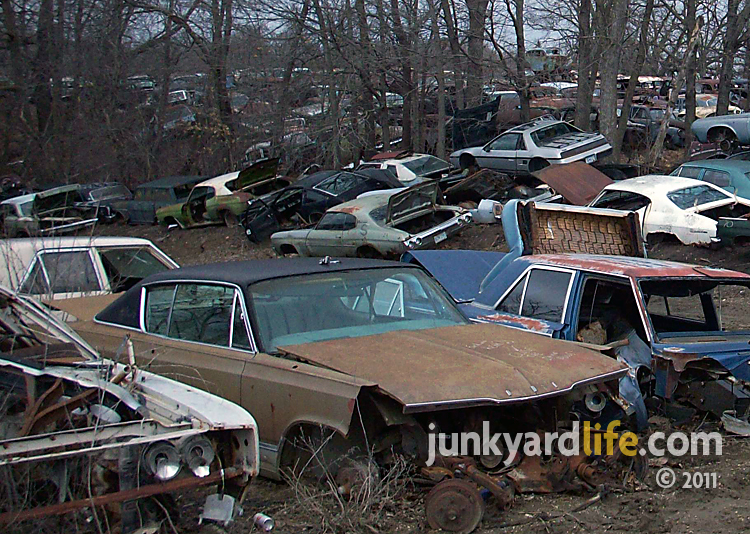 Ford Granada on top, wanted by Mustang and Falcon owners. 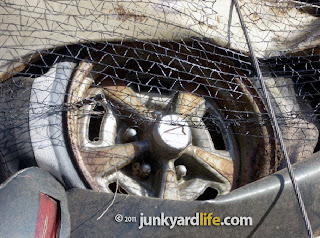 Unrecognizable Pontiac with good 15-inch Rally II wheels. 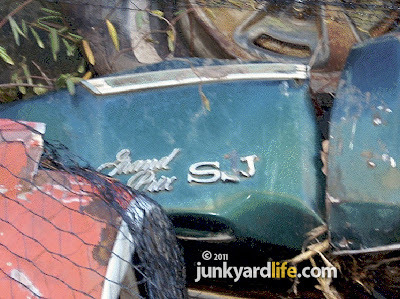 In my opinion the Pontiac Grand Prix SJ was the worst crime of the entire scene. 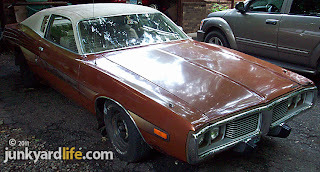 I'm one of the few people I know that love those Colonnade-style Grand Prixs of the '73-'77 body style now, but I crystal ball that these cars will be valuable. They are already hard to find and I want one bad. 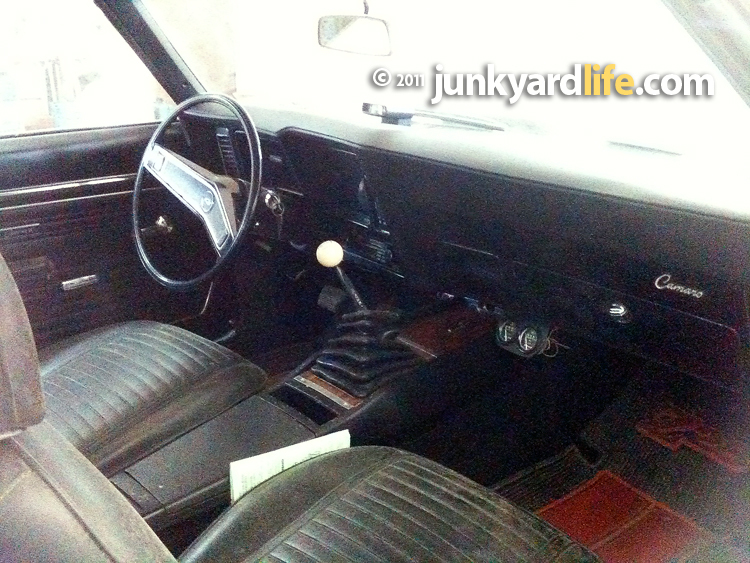 To make matters worse, this was the top of the line SJ model that was packed out with options such as a 455-V8, bucket seats and console. Often equipped with power everything and a lot of classy touches that made this car more exclusive and very expensive compared to other entry level models. 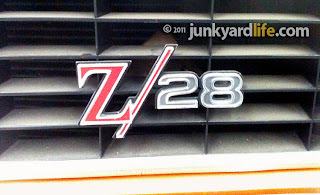 The SJ designation was inspired by Duesenberg and Stutz, if that tells you anything. 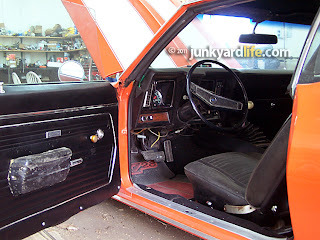 To top that all off, if it wasn't heinous enough for me, this SJ example was in green. Ah, green. My color choice, second only to the beautiful Aztec Bronze. 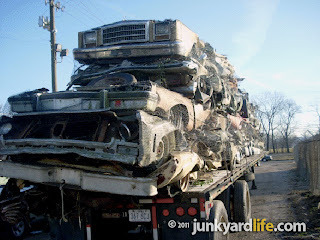 See the C10 truck? A Chevy Biscayne and Impala in there also. We cannot allow these kind of shenanigans to continue. This must be stopped. 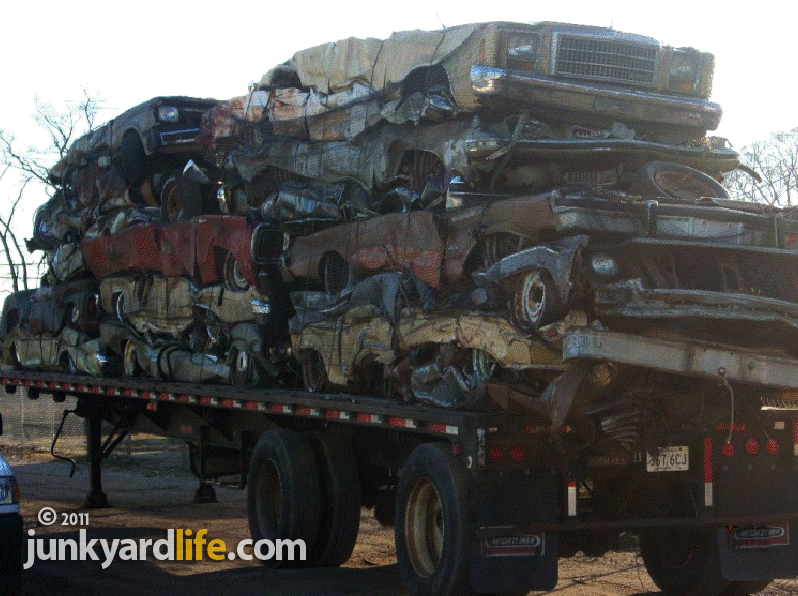 There needs to be some way to allow enthusiasts the opportunity to find a home for collectible scrap victims such as this. At least let us remove everything we can off of one car to save another. Kind of like organ donors do for humans. We can start by not letting even one get to be a potential scale victim. Save what you can and encourage others to restore and not crush. 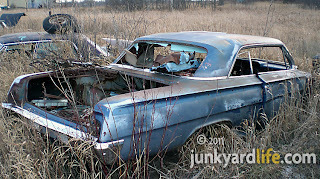 We have all seen those 'someday' cars that sit outside and ruin while waiting for their return to the road. I look at this scene and I see lots of opportunity that someone will not have in favor of aluminum siding. 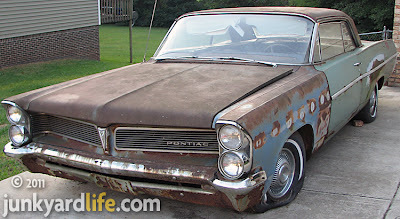 A 1963 Pontiac Catalina followed me home. 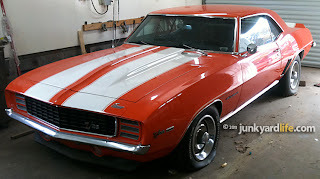 This time I may have gone a bit overboard when checking out a cool car to write about. Junkyardlife guys love finding a cool car, photographing it, dreaming a lot and then writing the whole thing down. 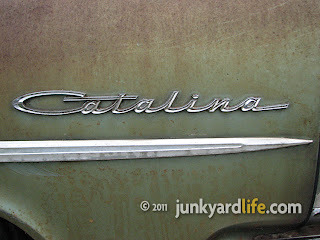 How much further did I go with this Catalina? It is now in my driveway. The story unfolded innocently enough. 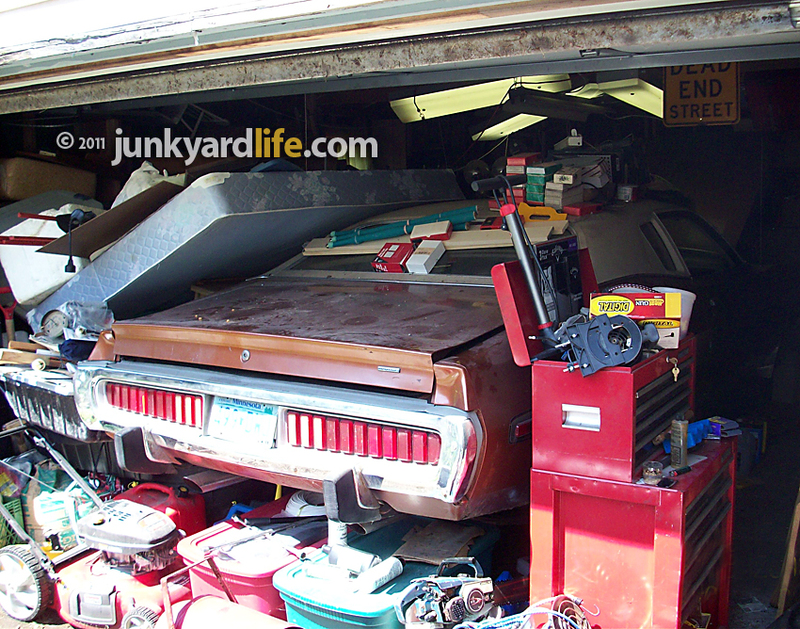 I went to a house where I heard someone had some Oldsmobile parts for sale. 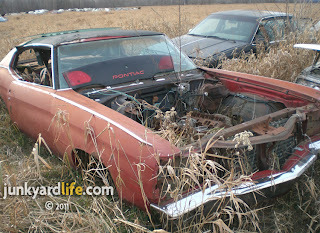 I was looking for an A/C bracket for my 1979 Trans Am and I came back with this big, crusty Pontiac. Yep. It’s mine. That’s the good news. The bad news is also that it’s mine. It needs essentially everything. 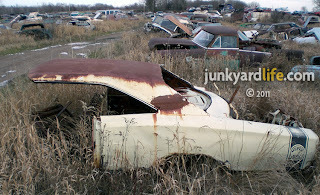 Dig what they gave you to hold on to when that GM Posi-traction rear end started side-stepping? In this case it was used to guide grandma to the fabric store. 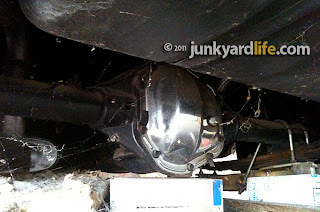 The Poncho has its original 389 4-barrel, Slim Jim transmission Power Glide combination. 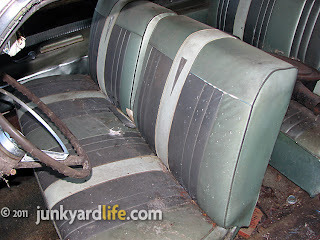 Its got bench seats with the way cool Pontiac emblem stitched right on them from the factory. That’s one thing I always thought was super cool about these cars. 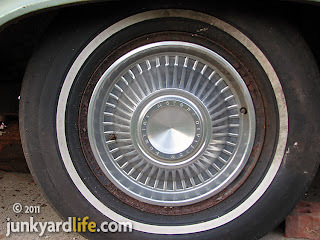 Four Pontiac Motor Division hub caps brighten up the rolling stock rims and the heater proudly declares Pontiac right across the dial. I have never seen that before and it very well may have contributed to the spontaneous “I’ll take it!” I somehow managed to tell the lady owner. My drooling completely negated any negotiating skills I may have ever had. This big Cat was only a little more than basic transportation of its day. 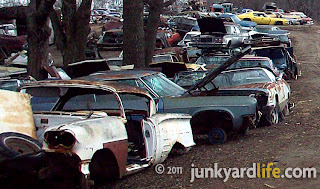 Not a lot of options here, which seems to be pretty collectible these days. This one has an add-on air conditioner from Sears that is mounted under the dash. That was not as uncommon as it seems. 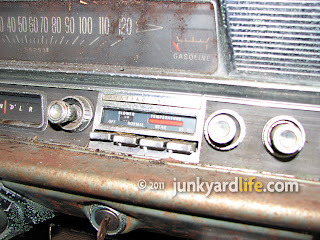 I understand Sears was a very reputable automobile air conditioning name at the time. Laugh, if you want. 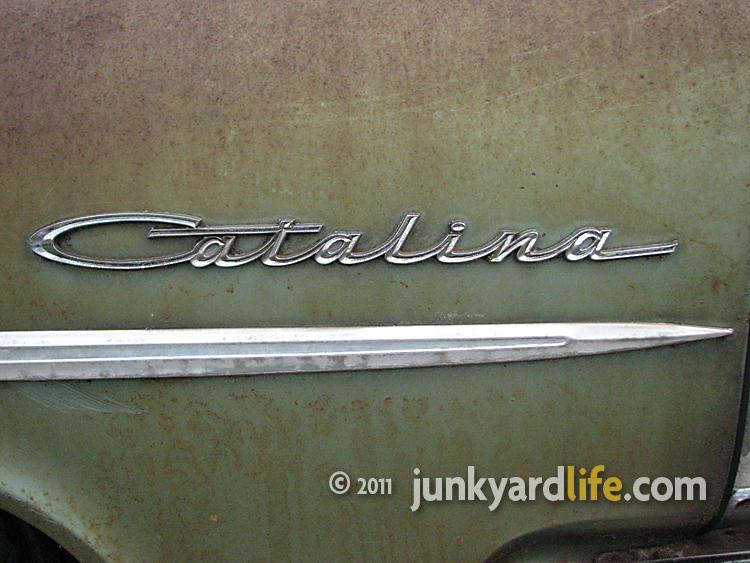 The ’63 was full of trim and emblems such as this Catalina fender emblem. 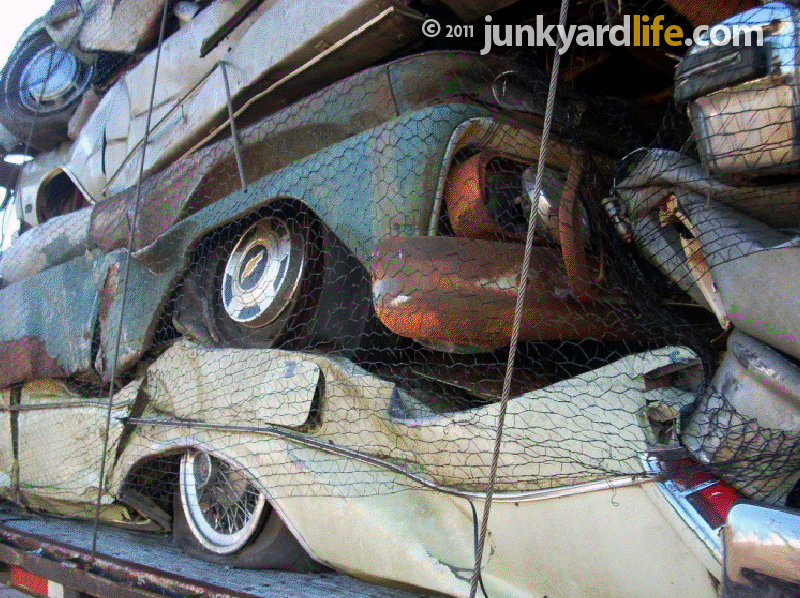 If only Pontiac were still around to give us a full-size, rear-wheel drive Catalina today. 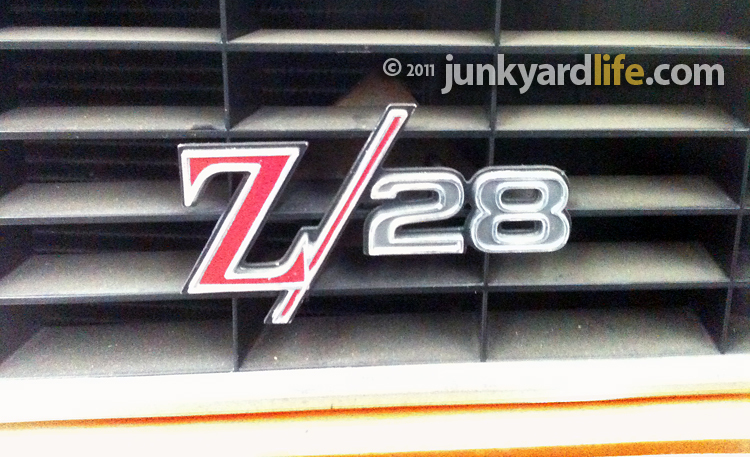 You could always bolt some of these emblems onto your 2009 G8. Imagine this cool bench with a long Hurst bent up and around. The seats are not bad. 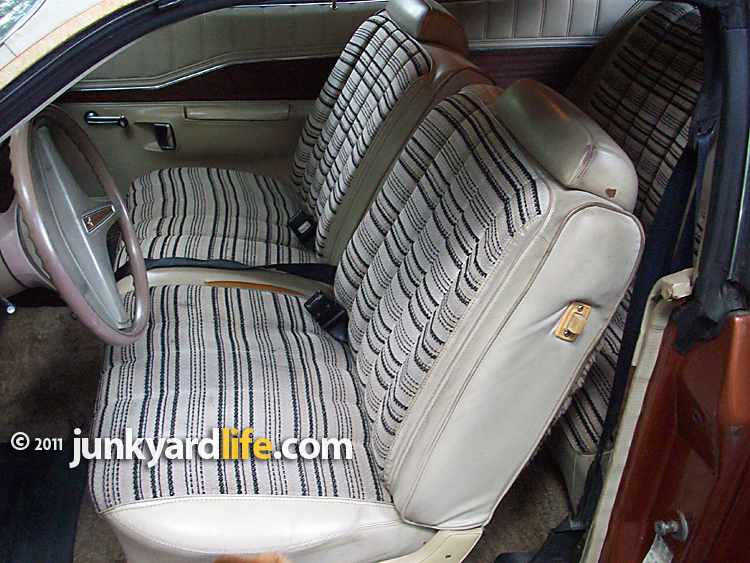 Plus, I love the Pontiac emblem stitched in the seats. Too many projects, what was I thinking? 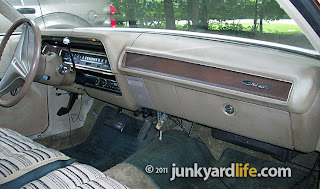 If I were to keep the Pontiac (which I cannot due to many other projects), I would have to hang onto the bench seat and find one of those base model shifters that curve around the sofa-like seat for my 4-speed! 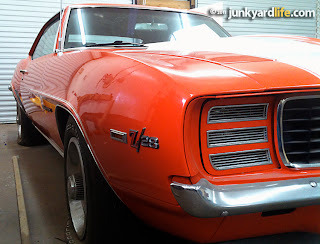 If I could not find a 421-cubic inch engine, I would build a 455 and spray it very Pontiac blue, then disguise it as a 421. 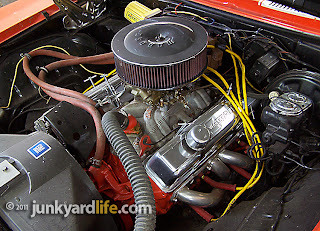 I would give Edelbrock a call and score a factory-looking aluminum intake to perch two Carters on top. 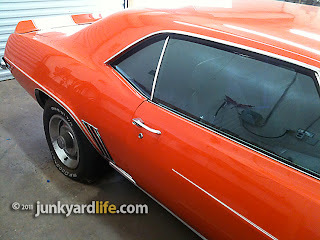 I would go back with the factory green on the exterior and (you know me! ), leave the hub caps for that ‘Earth Roaming Car Guy’ sleeper appeal. Aftermarket wheels? Sure, after you kill me! Here’s a bit of cool Pontiac trivia. Did you know Pontiac built 14 Catalinas strictly for the NHRA’s Super Stock drag races with aluminum bumpers, fenders and hood along with approximately 120 holes drilled into the frame to lighten the load even more? They were nicknamed “Swiss cheese” Pontiacs. In 1963 these modified, full-size Pontiacs did quite well at the track. 12-seconds and change on the 1/4-mile at 120 mph. Your average Joe may not have been able to stroll into a Pontiac dealership and order a Swiss cheese car, but he could check off a mean street car with 421 cubic inches of Pontiac fury with two four-barrel carbs and a mean four-speed. Sometimes a great project car can take years to find. Sometimes they just appear before you. I’m about to walk out and see if I can figure out what I’m going to do with this thing. 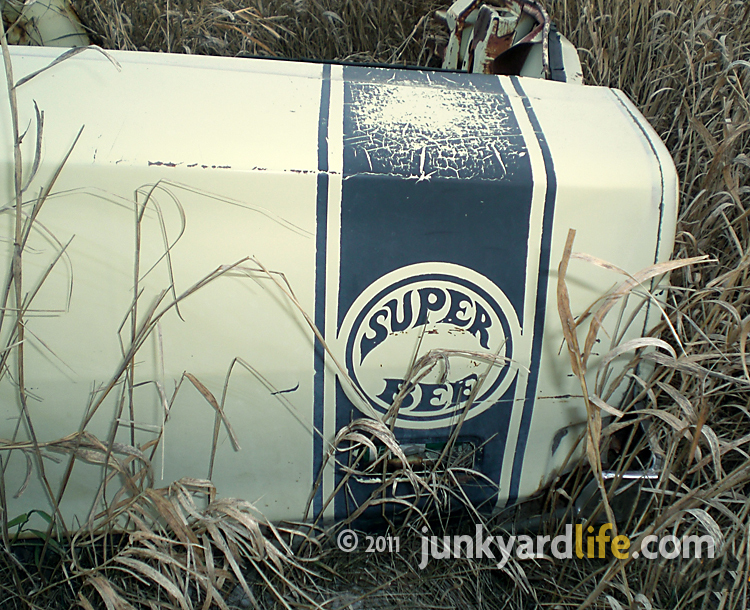 I may not be able to keep it, but I assure you it will not go to a car crusher. 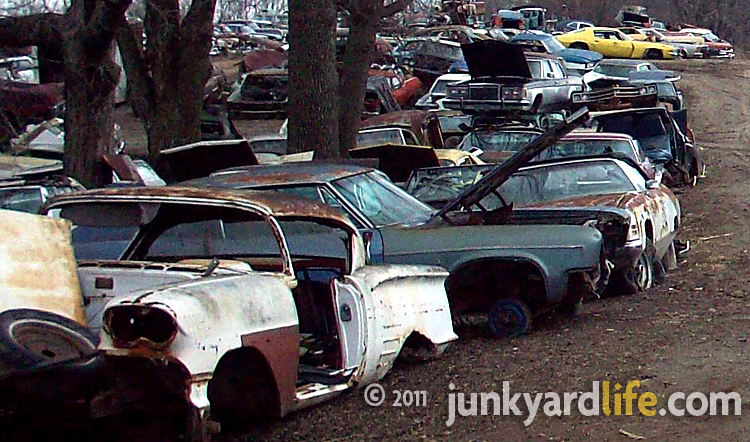 Save as many as you can, and as always… Happy Hunting! 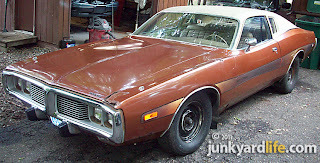 Marano soon had the 1974 Dodge Charger washed and running. Marano didn’t hesitate to say yes. He followed the man home after church and found a bronze 1974 Dodge Charger covered in dust and buried under boxes and a mattress packed in a tight, one-car garage. “After I got the Charger home I had it running in 10 minutes,” said Marano. 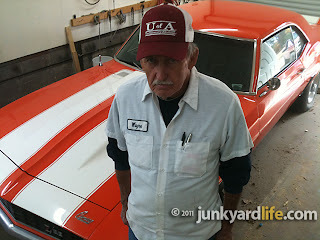 After rebuilding the brake lines and topping off the transmission fluid, Marano was driving the ’74 B-body around his neighborhood. 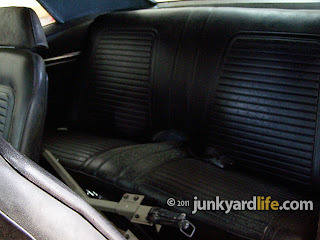 The 1974 Charger's interior is original and in good shape. 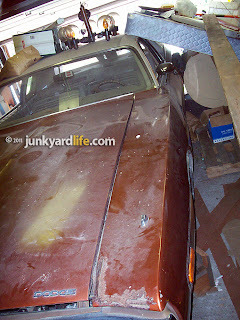 Rust as taken up residence in the ’74 Charger's rockers and quarter panel. 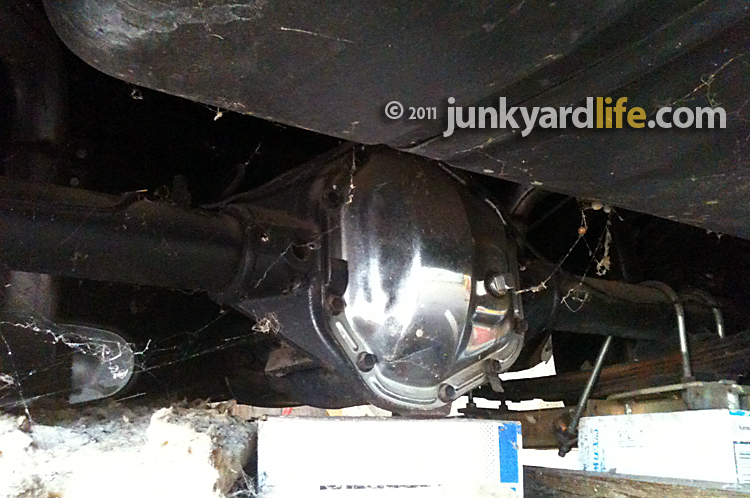 Don’t worry, you will see more barn finds and projects from Joe Marano. 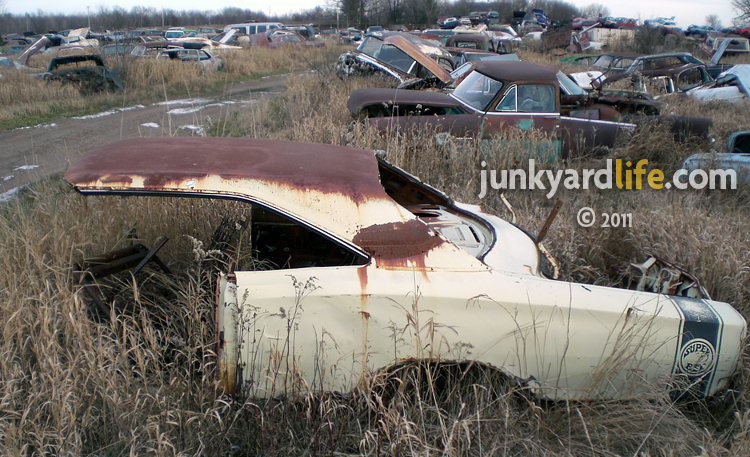 He has another Charger, a 1969 model, and runs across quite a few classic cars while running his junk car business called Junkers Towed by Joe. 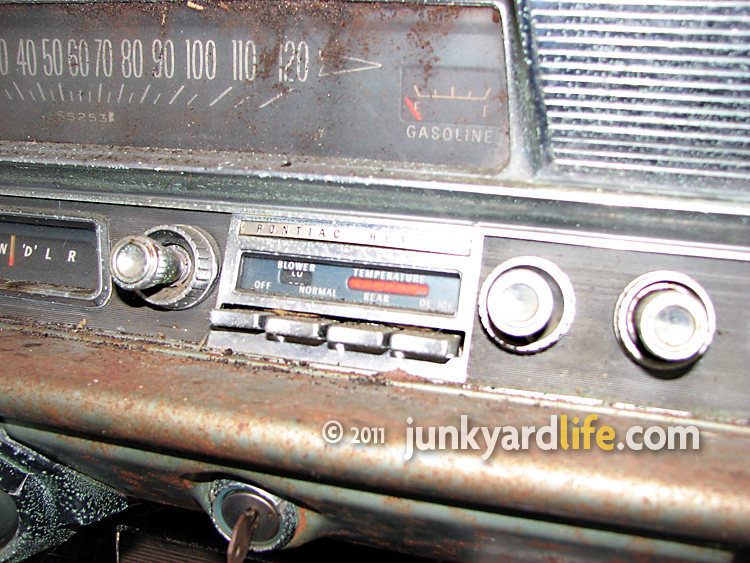 1974 was the last year for the third generation Chargers. 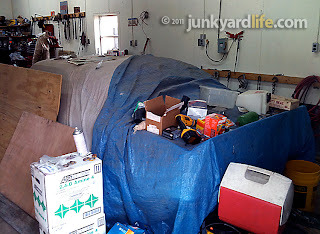 How many garages look like this? 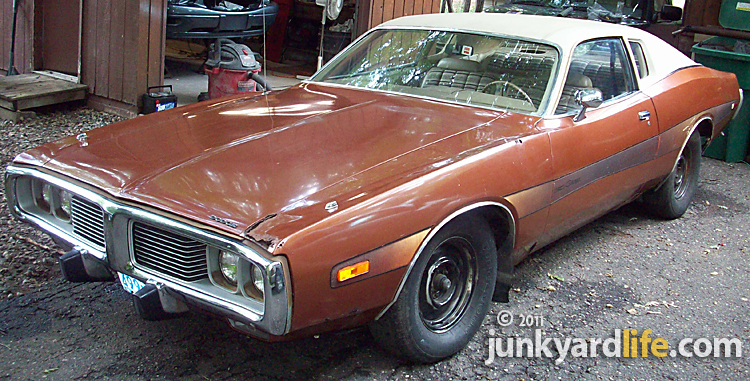 This 1974 Dodge Charger has reflective side stripes. Interior of a 318-V8 column shifted 1974 Dodge Charger. This ’74 Charger spent 20 years in this garage in Minnesota.